With so many wonderful new watches all in one place, it’s hard to zero in on just a few favorites. But I’ll try. Following are six watches that captured my attention at SIHH this year for a variety of reasons, including their mechanics, their looks and what they mean to a brand’s body of work. And with my strong penchant for ladies’ mechanical timepieces, it’s no surprise that most—though not all—of these fall into that category. The Limelight Stella from Piaget is, as I knew it would be, a truly exquisite representation of Piaget’s expertise in both jewelry and fine watchmaking. The first complication watch dedicated to women and entirely designed and developed in the Manufactures of La Côte-aux-Fées and Geneva, this 36mm gold watch features a highly accurate astronomical moon function, driven by the new in-house automatic Caliber 584P. The jeweled version shone here uses Caliber 580P, doing away with the central seconds hand to further highlight the gem-set dial. The moon phases appear on a disc decorated with stars and two moons driven by a 135-toothed wheel, thus the watch will require a one-day correction only after 122 years…but who’s counting? With a strong focus on women, as evidenced by not only its watches but also the predominantly feminine décor of its SIHH display, Roger Dubuis is expanding its Velvet collection with some luscious new timepieces. 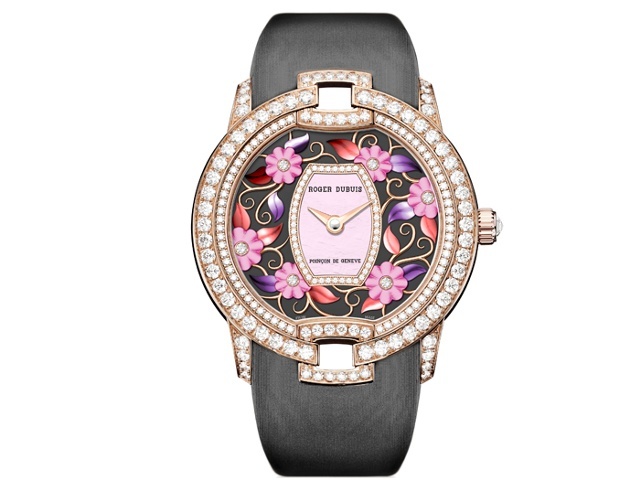 Shown here is the Blossom Velvet Pink in pink gold, with a mother-of-pearl dial embellished with a rosy-hued floral motif. Each enamel flower has a diamond center surrounded by gold stems and flowing tendrals, while hours and minutes are counted on the central tonneau-shaped dial. Inside is the Calibre RD821 bearing the iconic Poinçon de Genève quality hallmark. 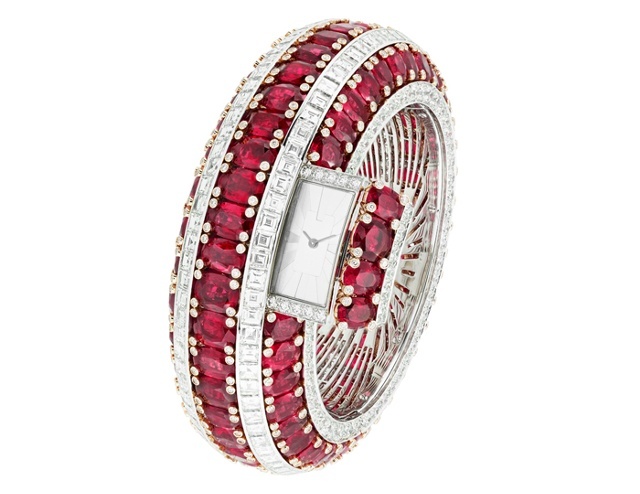 This watch’s predominant element is what gives it its name: rubies—115 of them in all, weighing a total of 151.25 carats—each exquisitely cut, set and arranged in three rows. White diamonds set in white gold further intensify their glow, while a touch of yellow gold adds warmth. An invisible hinge allows the piece to open as a bracelet, and a side mechanism, actuated by pressing on the adjacent rubies, reveals the quartz watch within. This unique piece required 1,500 hours of work to complete. I’m a huge fan of secret watches and I give this model high points for its dramatic looks and admirable precision of manufacturing. 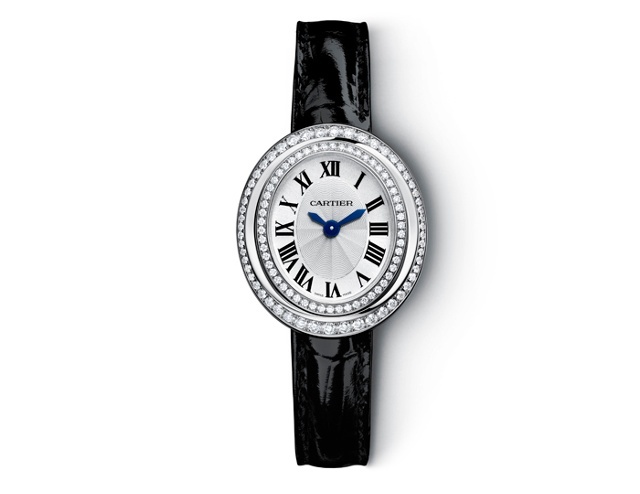 I eagerly anticipate Cartier’s presentation each year, since the company never fails to deliver great products that pique my watch and jewelry interests. This year was no exception. The new quartz-driven Hypnose collection comes in two sizes—small and large—and in white or rose gold, with or without a ribbon of lacquer surrounding the dial. 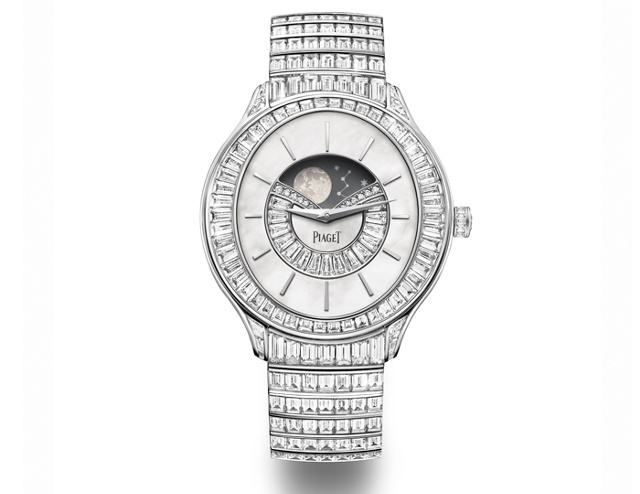 A collection of varying sizes of diamonds on the bezel interestingly highlight the oval shape of the watch. Dials are diamond-set or guilloche with central hour and minute hands. 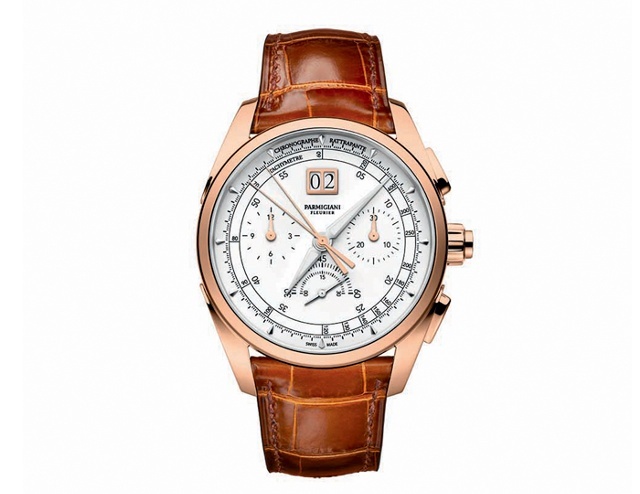 Celebrating 20 years in 2016, Parmigiani is introducing its first integrated chronograph movement in the form of the Tonda Chronor Anniversaire. Founder Michel Parmigiani explains its significance best: Since the very start of our watchmaking adventure, the idea of creating an integrated chronograph has always been close to my heart, he recently said. This dream became a reality on the eve of our 20th anniversary, and this is no coincidence—it is a reflection of our development as a manufacture. To successfully create an integrated chronograph, one must first master its imposing, meticulous assembly of constituent parts—not just their manufacture, but also their operation and function at the heart of a caliber, he explains. One must appreciate both their limits and potential. For this reason, an integrated chronograph is necessarily the work of an experienced manufacture. The Tonda Chronor Anniversaire is a reflection of 20 years of work. 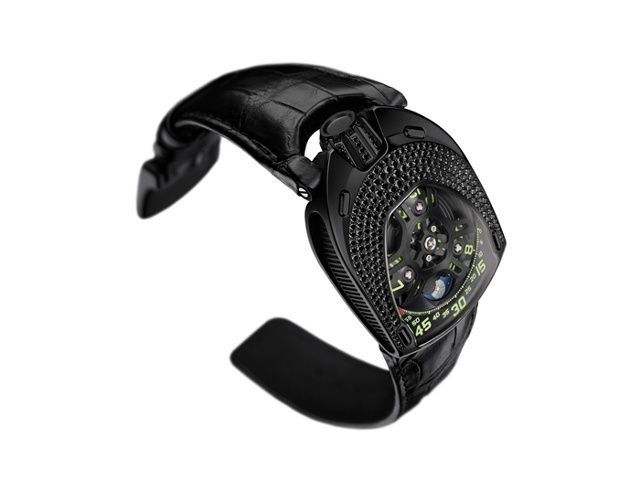 Urwerk does not spring to mind when I think of watches for women, but it seems that 2016 may change all that. The new UR-106 Lotus is the first watch from this independent brand that is especially made for women, and it features the brand’s signature satellite hours in a brand new way. With its glittering gemstones and soft curves we created the UR-106 with one image in mind: that of the lotus flower, which in my imagination represents the beauty of women in all their complexity, says Martin Frei, the company’s chief designer and co-founder. The UR-106 Lotus comes in two versions: titanium and steel with diamonds on the bezel, crown and buckle; and black PVC-coated titanium and steel set with black diamonds. Look at Mike Thompson’s favorites here and tune in tomorrow for Nola Martin’s SIHH favorites.